Alex Kidd in Miracle World / Alex Kidd no Miracle World (アレックスキッドのミラクルワールド) / Alex Kidd (알렉스키드) - Development - SMS Power! This code is executed when Alex is falling. If the RET NC at $3acd is not taken, the fall may end: Alex's falling sprite may be replaced by his walking sprite. When the code runs, the D register contains Alex's height (24 pixels) plus the distance to fall this frame (0-4 pixels). (IX+0Eh) contains the the Y-coordinate of Alex's sprite (recall that this will be 0 for scanline 1, etc). Their sum, calculated at $3ac8, is the Y-coordinate of the bottom of the sprite at the end of this frame. If this is greater than or equal to $bf (191 decimal), the bottom of Alex's sprite will be below the bottom of the screen (Y-coordinate 190, scanline 191). The code above, therefore, forces Alex to continue falling when he reaches the bottom of the screen. The effect of this can be seen only on those levels where it is possible to fall from one room to another. In v0, Alex will fall to the bottom of the screen and then the fall will end: the transition to the next room will occur with Alex's walking sprite shown. Once the transition is complete, Alex will resume falling correctly. In v1, thanks to the above code, the fall uses the correct animation frames throughout. This is believed to be the only difference between the v0 and v1 ROMs. 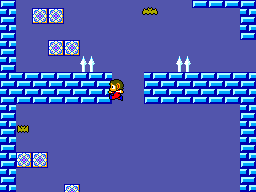 The above bug fix is also present in "Alex Kidd in Miracle World [BIOS]", but not in "Alex Kidd in Miracle World [SMS-GG] (TW)", "Alex Kidd no Miracle World (JP)" nor "Alex Kidd in Miracle World [BIOS] (KR)". For all states except state $6, bit 7 of the same byte is used to distinguish a change of state (bit 7 reset) from a continuation of the current state (bit 7 set). The main loop of the game looks up a pointer to the gamestate's main code from a table of pointers to gamestates and executes it. The score in Alex Kidd in Miracle World is always a multiple of 10. Internally, therefore, the game stores a value of score / 10 and simply adds a trailing zero for display. This value is stored as a group of three bytes in (little-endian) BCD format. The highest score attainable is thus 9,999,990. The score value is stored in RAM at address $c020. The value for the top score is stored at $c000. There are 8 ways to gain points during play. Each of these achievements will increase the player's score by a certain amount of points. These amounts are stored (in the same format as the score) in a lookup table at ROM address $489. Money in Alex Kidd in Miracle World is always a multiple of 10. Internally, therefore, the game stores values of money / 10 and simply adds a trailing zero for display. This value is stored as a group of three bytes in (little-endian) BCD format. The highest amount of money attainable is thus 9,999,990. The money value is stored in RAM at address $c030. There are 2 different kinds of money bags. A small one and a big one. Both of these bags will increase the player's money by a certain amount. These amounts are stored (in the same format as the money) in a lookup table at ROM address $483. If no buttons are pressed on the title screen, one of four demos will begin. Alex's movements during the demo are driven by simulated input - the data for this is in "TransBot" format and is located at $14d35-$1508d in the v1 ROM. In between the data for each demo is an unreferenced zero byte. Levels are stored as a sequence of screens, each 256x192 pixels in size. The screens are described by arrays of 16x12 bytes, where each byte is the index of a 16x16 pixel metatile. These arrays are compressed individually, using the "Phantasy Star" RLE format (without deinterleaving), and located in the v1 ROM within $18000 - $1bdb8. At runtime, one array at a time is decompressed to RAM at $d700 - $d7bf. Each metatile index is used to access a table of pointers. There are two of these tables, one at $14000 - $141ff and a second at $14200 - $143ff (used only for levels 14, 16 and 17). Each address in these tables is a slot 2 pointer into $14450 - $14d34; this region contains the four name table entries (8 bytes) to use for each metatile. $9 2 bytes Flags indicating if the entity is off screen. Each gamestate containing entities calls a function updating its entities (located at $2694) in its main loop. This function loops through the list of entities in RAM and per entity executes the entitiy's script, updates its position according to its velocity and calls a function to update its sprites (for details on this function see Sprite Handling section below). Before calling the function updating an entitys' sprites (located at $26d7) the function that updates the entites clears the SAT in RAM (Starting from $c700) by setting the pointer to sprite terminator ($c009 and $c00a) to $c706. After clearing the SAT in RAM the function starts filling it with the data of the sprite descriptor pointed to by the entity's pointer to sprite descriptor (ix+7 and ix+8). The interrupt handler will then copy the SAT in RAM (excluding the unused hole) to the SAT in VRAM by calling the function located at $1f7. To handle sprite flicker the interrupt handler behaves differently for odd and even frames. For odd frames it stores a direct copy in VRAM. For even frames it copies Alex's sprites in order and the rest of sprites in reverse order by copying from the end of sprites pointed to by the pointer to sprite terminator ($c009 and $c00a) down to Alex's sprites. The first 4 software channels are used for the music and the other 3 are used for sound effects. The sound control is located at $c110. When the top most bit of the sound control is set the engine is activated. Values from $81 to $b0 request playing a sound, $b1 to $b3 request effects. For example $b2 requests a sound fade out. Values greater than $b3 are considered invalid and will disable the engine. Sound effects have priorities associated with them. The priority of the sound effect that is currently is stored at $c113. If a sound effect with higher priority is requested the current sound effect will be canceled. To synchronize the Janken Match to the music a value is stored at $c115 when its music ends. Each sound request has its own header pointed to by a table starting from $98dd. A header consists of a variable amount of bytes depending on the value of its first byte. The first byte indicates how many software channels to use and is followed by 9 bytes per software channel that will be loaded directly into the first 9 bytes of the software channel's struct. The software channels will be loaded with data consecutively. The first software channel to start loading to is decided by the responsible request handling code. Byte value $00 will result in two full blank lines. Byte value $ff will terminate the ending sequence. Byte value $fe will terminate the current line (filling blanks to the end of the row) and draw one blank line (for spacing). 1 byte: the number of tilemap bytes for indentation, i.e. 2× the number of tiles to indent. This is always 4 to give 2 tiles indentation. This is a minimum to guarantee visibility on old TVs. n bytes: the line of text, encoded as ANSI + $90 (so space = $b0). $1c000 - $1c068 Compressed 4bpp Tiles: "Score"
There's an editor in development which can be found at http://kidded.emulicious.net. See also KiddEd. ^ This state uses the same code as state $a, the only difference is that in this state the map cannot be opened. ^ Similar to Teddy Boy. ^ Bank numbers used by Alex Kidd in Miracle World often have bit 7 set. ^ When the Animation Timer hits 0 this number gets increased. ^ When the Animation Timer hits 0 this value is loaded into the Animation Timer. ^ Called from the interrupt handling code. ^ This code is shared with the Clear Name Table Code. ^ This code is shared with the Disable Screen Code. ^ This code is shared with the Code above. ^ Only the digits 0-9 are used in-game (for the score and shop prices). ^ There is at least one pointer to every tile in the range $10341 - $118e8, except for those in $108e1 - $109a0 and $115e9 - $11678. ^ There is an unused zero byte at $1464b. ^ Each palette contains 32 colours. They are stored in the following level order: 1, 15, 3, 4, 5, 6, 7, 8, 11, 9, 10, 12, 2 & 13, 14, 16, 17. ^ Bit 0 indicates that a keyboard is used for input. If Bit 5 is set input is provided by the Demo. ^ Indicate what has to be done in the interrupt handler. E.g. if bit 0 is set sprites will be updated (The Temporary Sprite Attribute Table is copied to the Sprite Attribute Table in VRAM). ^ An array of structs, 32 bytes each. The size of this array is stored at $c0f8. Ingame the size is frequently set to $1e. ^ This data is periodically written to the Sprite Attribute Table. ^ This copy is created when entering the pause screen and is used to restore the Name Table when returning to the game.